Telehealth - Is It Really for my Organization? Wherever you turn these days in healthcare you are likely to see something on Telehealth or Telemedicine. Market predictions estimate the U.S. market to grow to ~ $40 billion by 2018 at annual growth rates from 18-30%. Industry statistics report greater than 50% of US hospitals have some form of Telemedicine. The American Telemedicine Association (ATA) reported >15M Telehealth encounters in 2015 with exponential growth predicted in 2016 and beyond. CMS reported reimbursement for Telehealth in 2015 was 25% greater than 2014. This may lead many healthcare providers to wonder whether now is the right time to delve into Telehealth or expand current Telehealth services. It’s a great question and one that requires strategic thinking to ensure an organization meets its goals and objectives. At Schumacher Clinical Partners (SCP) we developed a Telehealth Maturity model to demonstrate the current Telehealth market and describe the stages organizations go through in their Telehealth evolution. As the healthcare industry drives towards The Triple Aim - Improving the patient experience, Improving the health of populations, and Reducing the per capita cost of healthcare - Telehealth is becoming a key component to achieve these goals. A high percentage of healthcare organizations with Telehealth fall into Stage 1 or 2, many of which have been fairly successful with one or two Telehealth services, but as they look to scale and expand, realize there are barriers to program maturity. Common barriers include lack of enterprise leadership support, siloed service lines or little integration, lack of physician/clinical support, failure to create organizational buy-in to move to the next stage of evolution, and technology and operational infrastructure challenges. When stage 1 and 2 organizations identify lessons learned, they realize a lack of strategic planning and physician engagement are the main causes of limiting growth and success. So how can organizations develop a successful Telehealth program delivering world class healthcare services utilizing Telehealth? Component 1 (Develop a Telehealth Strategy and Plan) - Strategy and planning is a fundamental component to the development of a successful Telehealth program. In this step, an organization must align the Telehealth program to the overall organizational strategy. This process involves assessing the current market and challenges along with the organization’s clinical services and competitive forces to identify Telehealth opportunities. These opportunities can then be prioritized by evaluating their impact to the goals of the organization through a methodical approach. Once these opportunities are identified the organization can create a comprehensive Telehealth plan that addresses key operational, clinical and technical considerations and defines the Value-on-Investment (VOI) to understand how services will provide clinical and financial justification. Component 2 (Secure Executive and Clinical Leadership Support) – Organizational initiatives often fail due to a lack of support and adoption within the organization. Often this is due to a lack of communication or detailed planning. Ensuring key stakeholders are involved in the process will help create organizational support and commitment. Key stakeholders (“Champions”) from all areas of the organization (executive team, clinical leadership, IT leadership, and operational leadership) identified in the planning phase must help evangelize the program throughout the organization. Part of the communication involves sharing the plan, benefits and metrics used to measure success. Component 3 (Procurement of Organizational Resources) – With support and buy-in from all levels of the organization, resource procurement becomes easier. It is important to have the right resources (money, people, technology, etc. ), at the right time during the implementation of Telehealth services. The planning phases should define what is needed and when removing barriers that often derail complex projects. Component 4 (Leadership and Management) – Deploying a Telehealth program involves assembling and managing a multidisciplinary team to both govern the program across the enterprise and manage the deployment and implementation of Telehealth services. A Telehealth Governance Committee should be developed to provide - overall leadership and accountability, vision and strategy, prioritization of Telehealth services, address risk and resolve conflicts, and provide growth planning and demand management. A strong project team with structured project management expertise will ensure a comprehensive project plan is in place and managed against. The project team is responsible for communication, documentation, integration of Telehealth technologies into clinical workflow and project reporting. A strong project team often determines the success of a project and the successful development of the overall Telehealth program. Component 5 (Clinical/Operational Support and Adoption) Operational and clinical support are required to ensure integration and adoption of Telehealth technologies into clinical workflows. This support will ensure Telehealth is an effective tool for clinicians as they provide quality healthcare to their patients. Support from areas such as information technology (IT), accounting and finance, risk management and adoption from physicians, nurses and other clinical staff, is critical for continued success and improvement of Telehealth services. Component 6 (Patient Education and Engagement) – An organization can create Telehealth services but patients must want to use these services. Patient engagement techniques are necessary to communicate availability of such services, educate patients on the value of the services and encourage them to take advantage of these services. Part of Telehealth program development involves the creation of patient engagement techniques and processes. Patient engagement must be factored in the design of services and tools, e.g. mobile apps can be designed to remind patients to take the medications or schedule follow up appointments based on their treatment plans. In summary, Telehealth services must be tailored to the unique and individual needs of each healthcare provider based on the demands of the patient population served by that organization. A one size fits all or a technology led approach will not appropriately meet the needs. Developing a strategy is fundamental and drives the development of a Telehealth program. A comprehensive plan can be built from the strategy to be executed by a multidisciplinary team of resources with support from all levels of the organization. 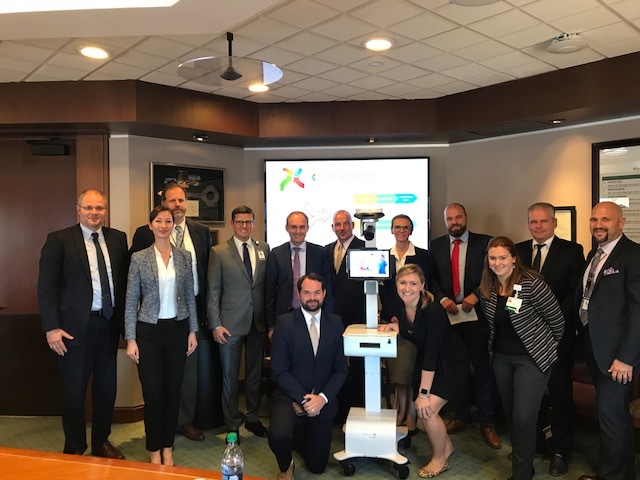 This support will help drive clinical adoption, empower the implementation team to deploy well-integrated Telehealth technologies and services, to engage patients and innovate care delivery. Schumacher Clinical Partners can help your organization design and implement a comprehensive Telehealth program. Please contact me, if you are interested in learning more about Telehealth and how we help organizations realize their Telehealth program objectives. I can be reached by email or by phone at 678-637-2920.